Commercial property/casualty insurance rates in the United States continued to register a decline in February, but showed little movement across sectors, according to online insurance exchange MarketScout. The composite rate remains at minus 4 percent. Richard Kerr, CEO of MarketScout noted that traditionally February has always been a slow insurance month, so the lack of activity in rates is not surprising. By coverage classification, commercial property saw the largest decrease at 5 percent, while business interruption, inland marine and commercial auto were all priced more competitively in February as compared to January. The rates for other coverages remained steady. Large and jumbo accounts were also down more in February, with large ($250,001 to $1 million) down from minus 4 percent in January 2016, to minus 5 percent in February 2016. Jumbo accounts (over $1 million), declined from minus 3 percent to minus 4 percent in the same period. All other account sizes matched the same composite rate from the prior month. By industry classification, manufacturing had a significant rate decrease from minus 2 percent in January to minus 5 percent in February. 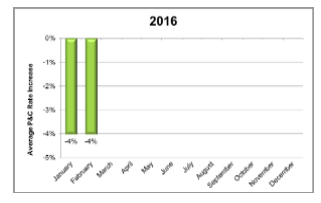 Habitational was down another 1 percent in February for a total of minus 6 percent. 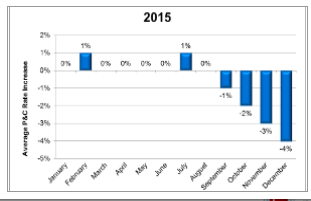 All other industry rates remained the same as in January, MarketScout said.